You can also listen to a Narration of Mr. Dalek and the Amiable Assassin as MP3. a TWIDW Production for Staggering Stories, Inc.
Adam and his guests were settling down to enjoy dinner. Adam wanted to play with the toys and do role-playing games, but he knew a certain amount of decorum was required to keep his friends coming back. Andy had arrived. Keith and Karen. Jean. Jo! Two mystery people who will have no dialogue and whose faces will stay just out of focus to allow other writers to play with timelines later if desired. And the empty chair. No sign of Tony. Again. Adam went to slice the bread. In the center of the table, a luscious red wine sat forlorn. Just about everybody at the dinner table had sworn off alcohol for various reasons. This wine kept coming from the wine cellar, sitting on the table untouched, getting just a tad warm, and then being put away. The wine wanted to be drunk. Its purpose in life was to satisfy taste buds and give sensory pleasure. Once again, it looked like it would remain unopened, unloved. Everybody gasped. THE David ----------. The guy who made his living -------, was beloved by most of the country, and had a very hot lover. Full fledged star-struckiness was in danger of occuring. Yes! went the Wine. People are going to drink me tonight! Boo yeah! David, pulling out a long stick-like device: 'Well, you are close enough. Feel my wrath!' he cried, pressing a button on the stick. Mr. Dalek's extermination arm pulled out of his body, flying into the room and knocking over a head bust of Jon Pertwee that Adam had lovingly mounted. Mr. Dalek could also feel that his elevation thrusters were offline. What was that thing? Mr. Dalek dared not risk another shot. He backed out of sight, flipped around, and drove rapidly back to Adam's room. Mr. Dalek: 'Et tu, Creap-eh? Then fall Mr. Dalek.' Mr. Dalek lowered his eyestalk to half-mast. 'I will be in the hallway awaiting certain death if anybody is looking for me.' Mr. Dalek headed for the door. They left the room, but not enough for the turbolift doors to close. Mr. Dalek made a mental note that Sparacus was a good egg. His extermination could wait, and would be as painless as possible. As for the traitors who had known and feared him for years ... internal power was back to 5%. 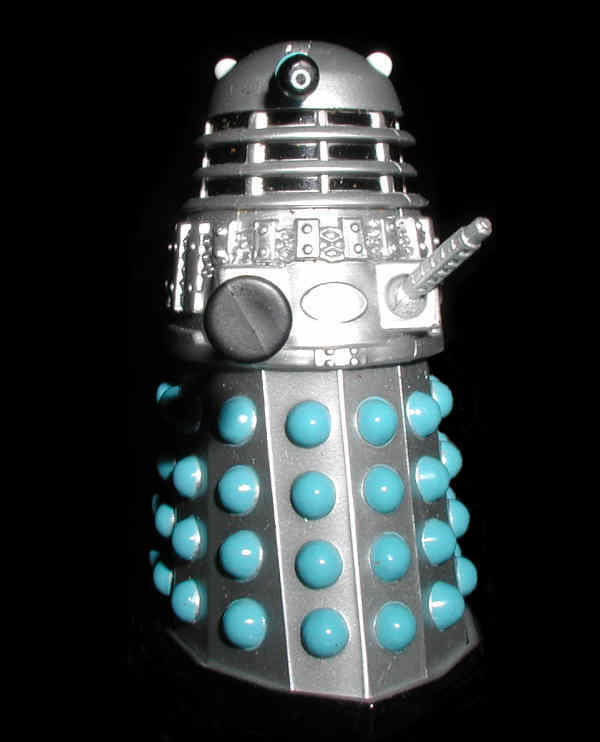 Mr. Dalek could activate - Secondary Extermination Stalk! A miniature version of the Dalek stalk emerged. Mr. Dalek: 'Size is not important. Merely precision. Now, just one thing before we go to certain death.' Mr. Dalek blasted the sprinkler in the ceiling in Adam's room with a painfully slow ray. Water sprayed all over the place. Adam would be most sad over rare and valuable books being ruined, but Mr. Dalek had to make a point to the others. The toys all trembled as the water reached all parts of the room - they had watched Adam's DVDs. They knew what would happen next. Mr. Dalek pointed at the water and EXTERMINATE!!! David: 'You know - it is sometimes said that the essence of a soul can be found in a pocket watch. Open it up, please.' Very slight waver of the Sonic Stabilizer in Adam's direction. Adam opens the watch. A flash of yellow light escapes, plays around, and comes into Adam's eyes. His eyes burn brightly for a moment before returning to normal. You can almost hear the choir sing/shouting as Adam stands completely erect. Adam's hairline moves forward a bit and the gray hairs turn jet black. His face looks just a tad shiny and Hollywood. His suit grows pinstripes. The music peaks - and stops. (Elevator Music Imperial March begins) Sparacus: 'You will not threaten my friend. I will stop you with my half-fish power!' Sparacus begins a graceful swim towards Adam, flowing free and powerful. About 4 feet into the swim Adam exterminates him. 'AAAAARRRRGGGGHHHHH!' and all that. The music finally stops, to our relief. Mr. Dalek was hopelessly outnumbered here. Adam had gone crazy and had Mr. Dalek's gun. The flight thrusters were still down. Mr. Dalek's new friend and all his subjects were dead (most by Mr. Dalek's own hand, but dead is dead). Adam's friends were immobilized. This looked like the end of Mr. Dalek. To think - all this happened because of one chance encounter. Mr. Dalek was cranky at the wrong moment and annoyed the wrong power mad toddler. It was enough to make one rethink one's life. How much of the pain and suffering here was Mr. Dalek's own fault, and what did he feel guilty for? How could things be made right? What had he lea (EXTERMINATION BLAST) AAAAAAAAAGGGHHHHHHHH!!!!!!!!!!! Hello, everybody. Mr. Dalek here. I'm afraid I just had to exterminate the writer, Mr. Elliott, and take over this story. He was a nice enough guy and a useful quizzling for my schemes, but he failed the basic rule of writing for me, Mr. Dalek. Rule #1 - I am a Dalek! I am not some human or some weak-willed cutesy alien who will change their plan whenever the right human comes around to teach morality. Daleks have no morality! We scheme. We plot. We plan. We win because we are smarter than you. Now, Mr. Elliott may have written me into a corner here, but I have Dalek wiles on 1960s levels. David forgot something very important in his scheming. Pay close attention to the truth. David did as I requested, and everybody was free in time to either wish him well or give out a death threat. I made David give me another 6 pocket watches like the one he'd planted on Adam earlier - I could use them to give new personalities to my subjects in Adam's room when they come alive again. Brand new people to exterminate - bliss. David left our house and got into his car - which was promptly pulled throuh space into a flying saucer. Still, that is somebody else's story - I was just glad to be rid of the pest. I tried to warn Adam/El Presidente about the watery conditions in his room and the mild dead-ness of his worldly possessions, toy or otherwise. But he did not listen. The doors to his room opened... He has not stopped screaming yet. I think the screaming helps him heal. The wine was never drunk. It lived till the year 2164, alone and unloved. Written - June 2009 by Benjamin F. Elliott.